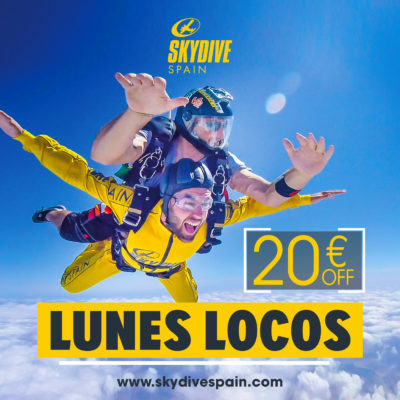 We have added a new online booking discount for our tandem skydives: Lunes Locos! Come jump with us on Mondays and get a 20€ discount on your tandem skydive. Mondays can be awesome too, we want to encourage people to live the breathtaking experience of skydiving for the first time at a great price. Why not stretch the happiness from the weekend to Monday? Jump from 15.000 ft. for only 209€! If you want to share the experience with your loved ones, you can walk away after your jump with a USB drive where we save the videos & photos of your jump. And by the way, get ready to get pats on your back, likes and looks of admiration (at least for a few hours) from everybody around you. You have the choice of getting an external video, where a camera instructor will fly near you recording your freefall or you can choose to have your own tandem instructor record the video with a handycam attached to his wrist. You have the option of jumping for only 169€ from 10.000 ft. too, where you will enjoy a freefall of around 35 seconds. Lunes Locos are not available when other promotions are happening at the same time. When you book your tandem skydive online on a Monday (and it doesn´t overlap with another promotion, as Christmas), you will see during the booking process that both the 15.000 and 10.000 ft. tandem skydives are available at the discounted prices under the name “LunesLocos”, which is the product name. Taking your first tandem skydive? Have you already tried a tandem but haven´t got enough and want more? Whatever your reason is, our Crazy Mondays are available for you with your tandem skydive at a great price. Ready for Lunes Locos? 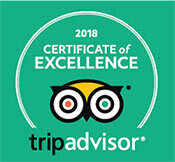 Let’s get booking!